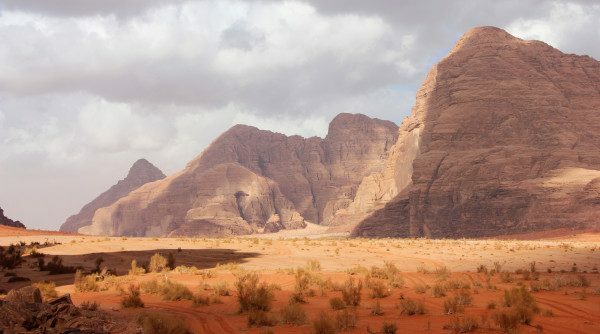 One of the places I was most excited to visit during my Jordan Tourism Board sponsored trip was the desert of Wadi Rum in southern Jordan – just 37 miles east of Aqaba. 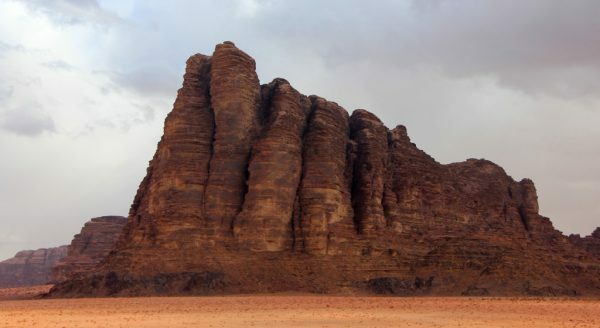 Wadi Rum is the largest and most famous wadi (valley) in all Jordan. Its scenery and rock formations are like nothing I had ever seen before. The verdict… They DO look like melting chocolate! The dark rusty red colors and the brown and orange-like sandstone colors, mixed with the unique natural shaped created by thousands of years of weathering, create an illusion that makes the rocks look like a malleable object. It’s so interesting to see how solid sandstone can give the impression of melting under the sun. Oh, but let me tell you this. 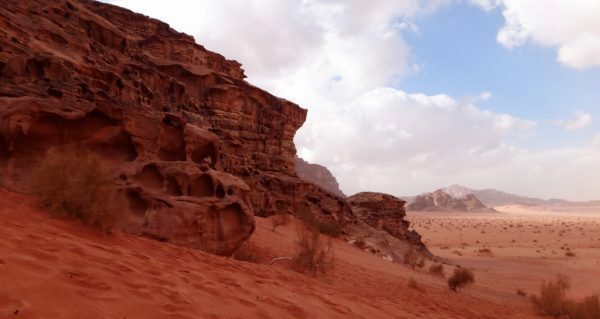 Wadi Rum is nowhere near hot during the month of February. It might be a desert, but temperatures here can be freezing during the day, and don’t even get me started about the night temperature (well, I’ll tell you soon). 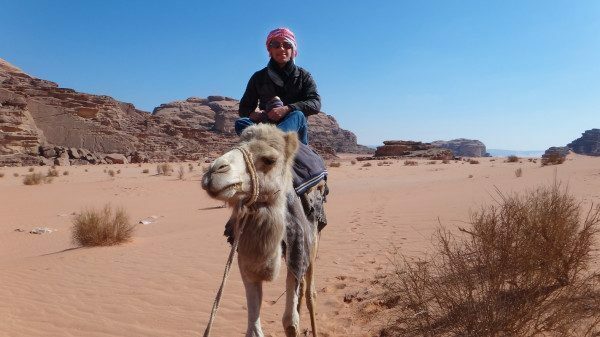 After leaving Petra, I spent my first day in Wadi Rum riding a Bedouin 4×4. 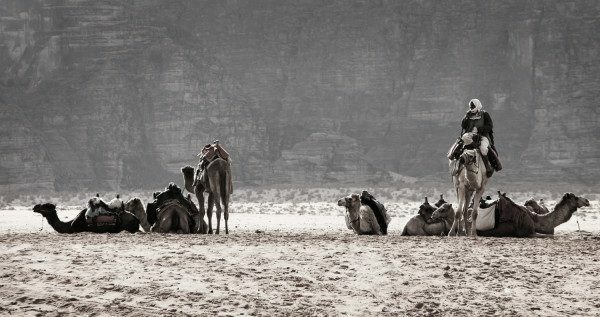 Bedouins who still live in the desert use their vehicles to give tourists a taste of the desert. This is now how many of them make a living, in addition to other means. One of the first rock formations I got to see was “The Seven Pillars of Wisdom”. It was named like this in the 1980s, in memory of the British officer T. E. Lawrence (Lawrence of Arabia) who based his operations here during the Arab Revolt of 1917–18, and who penned a book with such name. I could see the reference to such name in the rock formation. It looks like it is naturally made out of pillars that project out of the sandy floor into the sky. For the next three hours, I got to see rock formation after rock formation, and I was equally impressed by all of them. To me, it is crazy how such a beautiful environment can be not only visually pleasing but also historically and culturally interesting. We arrived at one Bedouin camp sheltered by protruding rock formations from three of its sides. Bedouins tend to build their camps surrounded by rock formations or low in the valley to protect themselves from the strong desert winds. 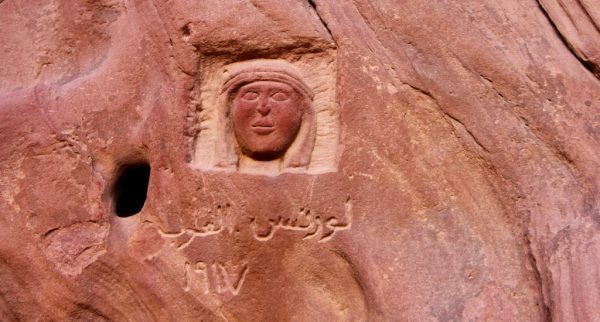 One interesting feature in this camp are the carvings of the faces of Lawrence of Arabia, Prince Abdullah Bin Al Hussein, and the Bedouin Sheik Odah Abu Taeh. This minute detail sets the entire desert in a historical context that had so much importance during the Arab Revolt of 1917-18. 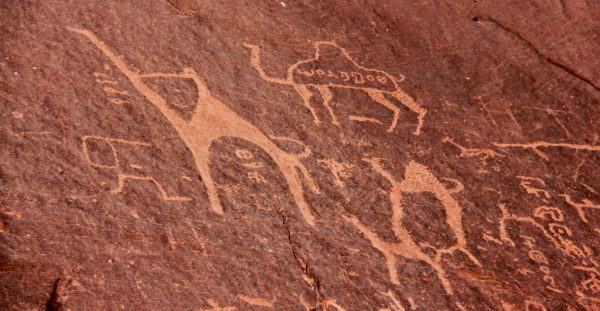 Mahmoud Twaissi, my guide, took his time to tell me all about the history behind the carvings and what Lawrence did at Wadi Rum. Lawrence used Wadi Rum as a base to camp in it away from the ottoman eyes and also to meet with the local Bedouins in the region to arrange a joined attack to capture Aqaba. 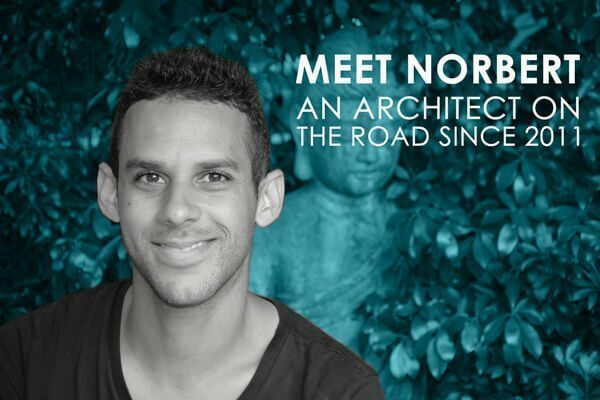 Just like my first visit to Petra, it rained at Wadi Rum… yes, it rains on the desert (Check Michael’s experience on a rainy night at Wadi Rum). I think the coolest thing about drizzling rain is that you get to see the desert and its formations with different levels of exposures. I could see how time passed as the clouds moved and cast their shadows throughout different parts of the desert, and let the sunshine through little pockets of clear sky. It was late afternoon, a sand storm was developing, and it was expected to snow later during the night. Yup, snow! We arrived at Captain’s Desert Camp, sheltered ourselves from the light, quick sandstorm and got ready to spend a cold night in the desert. 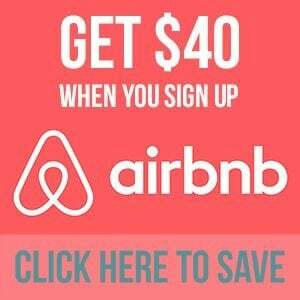 A word on Bedouin tents. They look beautiful and their thick goat fabric might look warm-ish, but inside the tent was almost as cold as outside! Needless to say, my four layers, gloves, and keffiyeh didn’t do much to keep me warm. It was time to go to the fireplace to have dinner and tea. Without much thinking, I stationed myself next to the fireplace for the rest of the night, chatting with other travelers and my guide. I simply dreaded the thought of leaving the warmth of the fireplace. I could hear the tents dancing under the strong winds outside; I could feel the cold air every time a gust made its way inside the tent. And to think the Bedouins live in these conditions. The cold was so strong; I could see no sleep ahead. That is until the magical shisha made its glorious entrance to the equation. I was recommended to smoke it and relax, in order to not feel the cold as much. Did they have to say it twice?! Hell no! 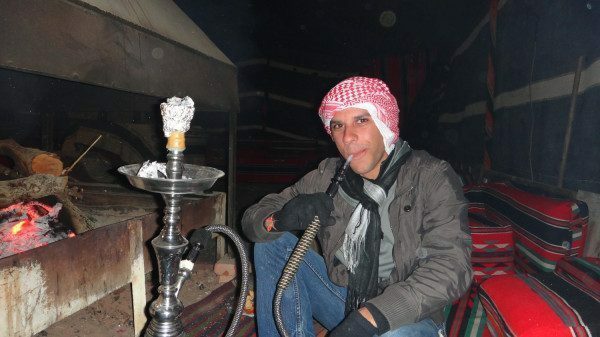 I took my apple flavored shisha, and inhale after inhale, I could feel things getting dizzier. After I don’t know how many puffs, I was “dumb” enough to go to bed. I stumbled my way to my tent, got in bed, covered myself with 4 thick covers, and I let the shisha do its magic. I was not cold. The next morning, the desert showed no sign of what happened the previous day. The sand was dry, the day was warm-ish, not a cloud in the sky, and not a single gust of wind. I was like I suddenly woke up in the perfect desert. The day was perfect to go camel riding through a different part of the desert I had not seen the day before. There I saw some beautiful Thamudic petroglyphs in the Khaz’ali Canyon, as well as more interesting rock formations. 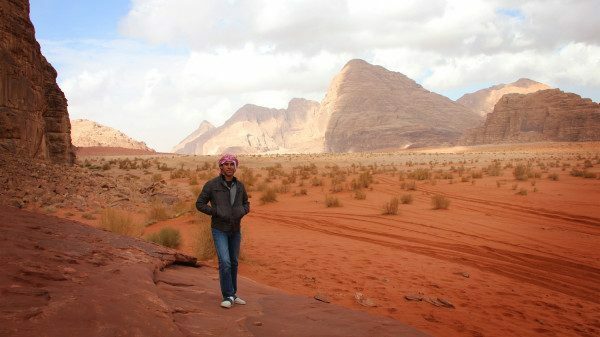 I had the option to stay a second night at Wadi Rum (and endure the cold) or I could go to Petra to see it at night. I loved my interesting night getting high at Wadi, but I chose to see Petra at night. Your pictures look amazing! What a beautiful place. Wow, awesome photos! The more I read about Jordan, the more I really want to go there. Nice photos! I was there in December and it was soooooo cold. You have had pretty exciting experience out there, haven’t you? A trip in the desert cannot be compared to anything else. Nice photos! Oh yes, I did! Thanks! Two nights ago, I won a trip to Jordan for two. I can’t really wait to go there and see its magnificence. Awesome!! Hope you have a great time there!